Luke 2:25-38 Now there was a man in Jerusalem called Simeon, who was righteous and devout. He was waiting for the consolation of Israel, and the Holy Spirit was upon him. It had been revealed to him by the Holy Spirit that he would not die before he had seen the Lord's Christ. Moved by the Spirit, he went into the temple courts. When the parents brought in the child Jesus to do for him what the custom of the Law required, Simeon took him in his arms and praised God, saying: "Sovereign Lord, as you have promised, you now dismiss your servant in peace. For my eyes have seen your salvation, which you have prepared in the sight of all people, a light for revelation to the Gentiles and for glory to your people Israel." The child's father and mother marveled at what was said about him. Then Simeon blessed them and said to Mary, his mother: "This child is destined to cause the falling and rising of many in Israel, and to be a sign that will be spoken against, so that the thoughts of many hearts will be revealed. And a sword will pierce your own soul too." There was also a prophetess, Anna, the daughter of Phanuel, of the tribe of Asher. She was very old; she had lived with her husband seven years after her marriage, and then was a widow until she was eighty-four. She never left the temple but worshiped night and day, fasting and praying. Coming up to them at that very moment, she gave thanks to God and spoke about the child to all who were looking forward to the redemption of Jerusalem. There are some people in the world who feel they might be too old, too young, too limited, or too insignificant to be of much use to God. Simeon and Anna, simple Joseph, and young Mary, are proof that God uses anyone, regardless of age, or status, who is submitted to the Holy Spirit. This offers great hope, confidence, and assurance that God uses the weak of the world to shame the things which are strong. 1 Cor 1:26-29 Brothers, think of what you were when you were called. Not many of you were wise by human standards; not many were influential; not many were of noble birth. But God chose the foolish things of the world to shame the wise; God chose the weak things of the world to shame the strong. He chose the lowly things of this world and the despised things--and the things that are not--to nullify the things that are, so that no one may boast before him. When Irving S. Olds was chairman of the U.S. Steel Corporation, he arrived for a stockholders’ meeting and was confronted by a strange woman who asked, "Exactly who are you and what do you do?" Without batting an eye, Olds replied, "I am your chairman. Of course, you know the duties of a chairman--that’s someone who is roughly the equivalent of parsley on a platter of fish." A follower of Jesus has a more important and significant job than a corporate CEO. Simeon and Anna’s lives are full of great lessons for us this morning. While Simeon’s words are recorded, the Holy Spirit confirmed them through Anna’s prophesy, giving two witnesses to this announcement about Jesus. Joseph and Mary were amazed at what they said about Jesus. They didn’t know Simeon and Anna. Still, these two elderly saints confirmed what the Holy Spirit had told them about this child, Jesus. How re-assuring and disconcerting this must have been for them. In any event, they had an important responsibility as Jesus’ parents. The text shows eleven characteristics of Simeon and Anna that the Holy Spirit will develop in us, who are seeking to do God’s will, at whatever age we may be. I will briefly point them out. 1. DEVOUT - Luke 10:25-28 On one occasion an expert in the law stood up to test Jesus. "Teacher," he asked, "what must I do to inherit eternal life?" "What is written in the Law?" he replied. "How do you read it?" He answered: "'Love the Lord your God with all your heart and with all your soul and with all your strength and with all your mind'; and, 'Love your neighbor as yourself.'" "You have answered correctly," Jesus replied. "Do this and you will live." Simeon and Anna were earnest, sincere believers who loved the Lord with all their heart, soul, mind, and strength. One of the most important pre-requisites to be used of God is to be devoted to Jesus Christ, His purposes, and His ways above our own. God will use a person based upon their devotion to Him, His Word, and His will above any other factor. 2. FULL OF THE HOLY SPIRIT - Eph 5:15-18 Be very careful, then, how you live-- not as unwise but as wise, making the most of every opportunity, because the days are evil. Therefore do not be foolish, but understand what the Lord's will is. Do not get drunk on wine, which leads to debauchery. Instead, be filled with the Spirit. Simeon and Anna were controlled by the Spirit; therefore, it was not unusual for God to speak to them. When a person is full of the Spirit, it means they are submitted completely to His control, His leading, and His enabling power. People who are filled with the Spirit have knowledge, insight, and wisdom that is supernaturally given. 3. PATIENT - Gal 6:9 Let us not become weary in doing good, for at the proper time we will reap a harvest if we do not give up. Simeon was nearly 80 years old and Anna was 84. They had waited a long time to see the Savior. Let us resolve to wait upon God to fulfill His promises to us. Let us not get weary, thinking that we need to run ahead of God and do things in our own strength, wisdom, or abilities. Love is patient, long-suffering, and kind. Let us wait on the Lord, be of good courage, for He will fulfill the promises of His Word. There is a consistent theme between the Old Covenant and the New Covenant. It is Jesus the Messiah. From their understanding of Old Testament prophecy, Simeon and Anna knew that the Messiah would be a light to all nations, not just to Israel, contrary to popular opinion. They were able to understand through spiritual revelation who the Old Covenant was speaking about. They saw the Savior as the One who would offer deliverance, salvation, and freedom from death, hell, judgment, and sin. They saw how the Savior would be the light to share God’s plan of salvation for all the people groups on Earth, not just to the Jews. Let us see the Savior as the light to all people so we can overcome any thinking that might limit our perspectives. 5. PREPARED OTHERS FOR REJECTION - Rom 2:8 But for those who are self-seeking and who reject the truth and follow evil, there will be wrath and anger. Simeon and Anna warned Mary and Joseph, "This child will be rejected by man in Israel and it will be their undoing." This must have been shocking to Mary and Joseph. Israel would reject their long awaited Messiah! We are still shocked when people reject Jesus and His salvation. When people refuse to trust Christ as their Savior, they do so to their own self-destruction. Rejecting Christ is the worse sin a person can commit. Rejecting Christ means an eternity of enslavement to sin, evil and judgment. Rejecting Christ means you remain an enemy of God and separated from His grace and favor. Nevertheless, we must warn others of the consequences of rejecting Jesus lest they too have to suffer needlessly. We must also encourage each other when we suffer rejection from unbelievers. 6. BLESSED OTHERS - Eph 4:15 Instead, speaking the truth in love, we will in all things grow up into him who is the Head, that is, Christ. Simeon and Anna blessed Mary and Joseph by speaking the truth in love. Let us not be shy about speaking the truth in love for it sets people free and informs them about God’s will, which is for good and not for evil, to give them a future and hope. Let us be used as a channel of God’s blessings to others throughout all the days of our lives. We can trust the Lord to give us opportunities to be a blessing to others. Obey God when He prompts you to be a blessing and do not worry if others misunderstand, or revile, or say things about you falsely on account of Jesus. Rejoice and be glad for your reward in heaven is great, for so they persecuted the prophets who were before you. Simeon and Anna declared that the Savior is a deliverer for all people. No doubt they received some criticism for stating this truth. 7. SUBMITTED TO HIS WILL - Rom 4:16-25 Therefore, the promise comes by faith, so that it may be by grace and may be guaranteed to all Abraham's offspring-- not only to those who are of the law but also to those who are of the faith of Abraham. He is the father of us all. As it is written: "I have made you a father of many nations." He is our father in the sight of God, in whom he believed-- the God who gives life to the dead and calls things that are not as though they were. Against all hope, Abraham in hope believed and so became the father of many nations, just as it had been said to him, "So shall your offspring be." Without weakening in his faith, he faced the fact that his body was as good as dead-- since he was about a hundred years old-- and that Sarah's womb was also dead. Yet he did not waver through unbelief regarding the promise of God, but was strengthened in his faith and gave glory to God, being fully persuaded that God had power to do what he had promised. This is why "it was credited to him as righteousness." The words "it was credited to him" were written not for him alone, but also for us, to whom God will credit righteousness-- for us who believe in him who raised Jesus our Lord from the dead. He was delivered over to death for our sins and was raised to life for our justification. Sometimes we may think that people are too old, too young, or too limited to be of much use to God. Abraham, Simeon, and Anna’s lives are a rejection of that notion. God used Simeon and Anna to announce and confirm that the baby Jesus was indeed the Messiah, who had come to Earth to save all people from their sins. That is the Gospel. Anyone can be used to fulfill Christ’s great commission. Do not underestimate what God can do through the weakest of vessels. Abraham, Simeon, and Anna lived everyday with a hopeful and expectant attitude that God would use them to see and do great things. People who live without hope are prone to depression, discouragement, and despair. When we stay in the Word and in prayer, we will live with great anticipation of how God can use us. People who have yielded their rights to God are fully persuaded that what God has promised He is able to perform. Let us not stagger through unbelief, but grow strong in faith, hope, and confident expectation of what God will do through us. 8. THANKFUL - 1Thes 5:16-18 Be joyful always; pray continually; give thanks in all circumstances, for this is God's will for you in Christ Jesus. 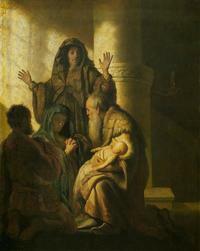 Simeon and Anna thanked God for allowing them to see the Messiah. Too many of us are not thankful for what we have in Christ. Thankful people learn how to be better rather than bitter from every circumstance in life. 9. UNDERSTOOD REJECTION BY SOME MEANS ACCEPTANCE FOR OTHERS –1 Pet 2:6-8 For in Scripture it says: "See, I lay a stone in Zion, a chosen and precious cornerstone, and the one who trusts in him will never be put to shame." Now to you who believe, this stone is precious. But to those who do not believe, "The stone the builders rejected has become the capstone," and, "A stone that causes men to stumble and a rock that makes them fall." They stumble because they disobey the message-- which is also what they were destined for. God’s plan is to bring the light of salvation to the Gentiles through the Israel’s rejection. God uses Simeon and Anna to declare that rejection of the Messiah is predicted. Christ will not be well received by all. Let us not feel that people are rejecting us when we present Christ. They are rejecting the only Savior at their own peril. 10. KNEW CHRIST IS THE REVEALER OF HEARTS - James 4:4-6 You adulterous people, don't you know that friendship with the world is hatred toward God? Anyone who chooses to be a friend of the world becomes an enemy of God. Or do you think Scripture says without reason that the spirit he caused to live in us envies intensely? But he gives us more grace. That is why Scripture says: "God opposes the proud but gives grace to the humble." Thus when Simeon says that Christ is set for the rise and fall of many and for a sign spoken against, that thoughts of many hearts may be revealed, we understand that what is revealed is whether a person has a heart humble enough to trust Christ alone for salvation or whether the person is proud and must be humbled. Beware of pride in your own life. Pride will prevent us from receiving the grace of God. 2 Tim 4:1-4 In the presence of God and of Christ Jesus, who will judge the living and the dead, and in view of his appearing and his kingdom, I give you this charge: Preach the Word; be prepared in season and out of season; correct, rebuke and encourage--with great patience and careful instruction. For the time will come when men will not put up with sound doctrine. Instead, to suit their own desires, they will gather around them a great number of teachers to say what their itching ears want to hear. They will turn their ears away from the truth and turn aside to myths. The truth often hurts. Nevertheless, like Simeon and Anna, we are to preach the Word when it is convenient and when it is not. It is a loving thing to do. Let us do all that we can to convince people of what is true and not let rejection hinder us. 11. MET CHRIST BEFORE THEY DIED--2 Cor 6:1-2 As God's fellow workers we urge you not to receive God's grace in vain. For he says, "In the time of my favor I heard you, and in the day of salvation I helped you." I tell you, now is the time of God's favor, now is the day of salvation. This is another application from the lives of Simeon and Anna. Meet the Messiah, before you meet death. Meet Him today. We have no guarantee that any of us will see 2013. So, if you died today, where would you spend Eternity? Unbelievers want a world without God. They are working hard to eliminate Jesus from all of society. Such a place already exists. It is called Hell. They will eventually get what they want. They will get to spend Eternity in Hell without God. Jesus came to save us from that world, and for those who confess Jesus as the Christ, repent of their sin, give Him their life in baptism, they are saved from this godless world, called Hell. They are also given the Holy Spirit, eternal life, and a home in Heaven.